Night diving is great fun regardless of when you do it, seeing the vibrancy of nocturnal life that lives on your local reef or dive site at night is amazing and you will discover why it is many peoples favorite recreational diving experience. Let me explain what Super and Micro Moons are and why they are hugely important to us as night divers. There are many phases of the Moon, we have Full Moons, New (Black) Moons, Waning and Waxing Moons. Super and Micro Moons are not really phases of the Lunar cycle but special times in the Lunar orbit of Earth. A Super Moon is the co-incidence of a Full Moon coupled with the closest approach it will make past the Earth as it orbits us. This Super Moon to the naked eye will make the moon seem bigger and brighter than normal, the article picture is a great representation of the moon and how it changes in size when viewed from Earth during a Super Moon. A Micro Moon, you may have already guessed it, is the co-incidence of a Full Moon and the Moons furthest distance away from Earth. Making the Moon appear smaller to the naked eye, and less bright. Just to clarify things, the Moons orbit is not a perfect circular path around Earth, because of the effects of gravity from the other planets in our solar system and our sun the Moon gets pulled and pushed around by tens of thousands of kilometers, which all has an affect on our blue ball. So why are we talking about Super & Micro Moons, lets talk about night diving, no problem. As you know the Earth and the Oceans are heavily affected by the Moons gravity, it’s actually the primary cause of tides, a Super Moon has the greatest gravitational effect causing the most amount of gravity to pull on our oceans. Strangely enough, the coral reefs of the world seem to know about it just the same way they know about a Full Moon, which causes all sorts of things to happen like ‘Mass Coral Spawning’ events. To quickly explain that further, a Full Moon triggers many reefs around the world to spawn, releasing their sperm and eggs to meet and form these coral reefs. But there is clear evidence not all types of coral do this every Full Moon and that some re-produce far less regularly, like when there are Super Moons. That means different reef behavior, different reef critters and just another amazing opportunity to discover things we did not previously know about our reefs at night. Micro Moons are very much the same, it is possibly a trigger for different types of Coral spawning. It is very likely that two of the biggest triggers to coral reef spawning events are gravitational pull from our Moon, plus the amount of light it reflects back to us here on Earth. The Corals are basically watching for the right time and when it arrives, they all get jiggy. So that should give you an idea of just how alive our Coral Reefs are, there is a reason they are called the worlds largest living organisms, simply because it is all one giant interconnected carpet of living, breathing & re-producing life. It deserves our utmost respect when visiting and our best efforts at conservation when not. So here at Night Diving Phuket we like to get people in the water when these Super and Micro Moons are happening, we just never know what we will see, but we do know we will see some amazing and unexpected events. Reef spawning is one of those, but as more particles are in the water, that means more things feeding on them, more bio-luminescence and weird, wonderful creatures. The next Micro Moon is happening on Mon, 28 July, 2014 and yes we will definitely be night diving that night. 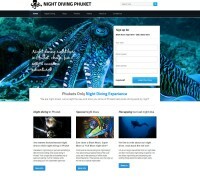 Closer to the date you can sign up for it via the form on the homepage or in the Special Night Dives area of our site. The next Super Moon is happening on Sun, 10 August, 2014 and yes we will definitely be night diving that night. Closer to the date you can sign up for it via the form on the homepage or in the Special Night Dives area of our site. Also note that these dives can only happen in conjunction with these events, they simply don’t happen very often, Super Moons can be separated by years, so don’t hesitate, get in contact with us and see this amazing spectacle of nighttime diving! This entry was posted in Night Diving Facts on March 27, 2014 by simon.